Recent legal maneuvers in Brazil deposed President Dilma Rousseff. Her valiant efforts to battle corruption and develop social inclusion have been cast aside by corrupt Brazilian legislators & judges, whose stated reason to impeach the President, (budget manipulation, pedaladas fiscais), was very distant from personal theft or corruption. More background is available here, and here (link). 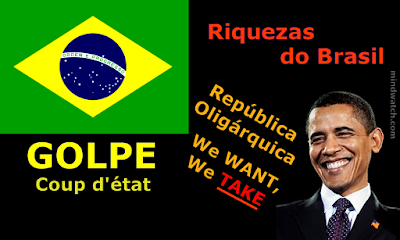 US President Obama's government has not supported democracy in Brazil; but Yanqui's done plenty of high-level spying. Did the USA take opportunity to strongly back Rousseff's progressive government? No Way. Just the opposite -- as in Honduras, it's likely the imperialist hijacking of resources will now intensify, ignoring environmental concerns. Worse, we may see the growth of death squads as in Honduras and Egypt, with support that stretches back to Washington DC for extrajudicial violence. Tragic.